﻿ RESERCH AND DEVELOPMENT｜SRD HOLDINGS Ltd.｜SAKAMOTO INDUSTRY CO.,LTD. NEXT-GENERATION STANDARDS, ACHIEVED THROUGH RESEARCH AND DEVELOPMENT CAPABILITIES. In order to develop and commercialize the products that the market demands, we utilize a variety of performance tests in our factories to achieve quality performance, strive to reduce costs, and also work to develop, test, and research new technologies. Installing high performance software to raise technological capability and improve development speed. 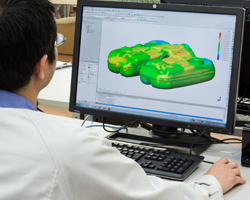 Our company actively introduced IT into the R&D department from the early 1990s and implemented advanced simulations based on 3D modeling by leading-edge CAE systems. For example, in the development of exhaust system components, simulation technology to visualize air-flow and noise characteristics permitted the creation and expression of a low-noise exhaust sound that is kind on the ears. It also realized a dramatic decrease in development times. This strong development ability is highly regarded within the industry. Research equipment to support leading-edge technologies. 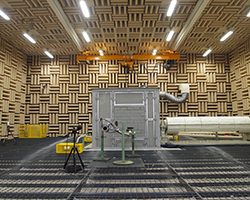 A range of large and small testing equipment, including fully automated, unmanned durability testing machines that work continuously night and day and a full-anechoic chamber that can accept entire vehicles for noise and vibration testing, is available to conduct strict checks on whether the products realize the performance derived from simulations, if they have the durability to withstand severe operating conditions, and whether their performance varies due to the environment. The in-house LAN supports R&D activities across the entire organization, including distributing test data to each department for performance analysis. R&D activities from worldwide perspective. How to deal with environmental problems has been a major research topic in recent years. We are continuing to devote our efforts towards research and development, seeking to create products that are friendly to the earth and do not burden the environment, through products such as emission systems parts that reduce C02 emissions as much as possible, and fuel systems parts that prevent release of vapor into the air through permeation.